Dr. Gerard Unger Born at Arnhem, Netherlands, 1942. Studied graphic design, typography and type design from 1963–’67 at the Gerrit Rietveld Academy, Amsterdam. He teaches as visiting professor at the University of Reading, UK. Department of Typography & Graphic Communication, and taught at the Gerrit Rietveld Academy till January 2007. 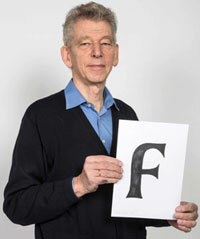 From 2006 till 2012 he was Professor of Typography at Leiden University, the Netherlands. Free lance designer from 1972. He has designed stamps, coins, magazines, newspapers, books, logo’s, corporate identities, annual reports and other objects, and many typefaces. In 1984 he received the H.N.Werkman-Prize, in ’88 the Gravisie-Prize, in ’91 the Maurits Enschedé-Prize and in 2009 the Sota-Award. In 2013 he obtained his PhD at Leiden University, on the subject of Alverata, a contemporary type design with roots in the Romanesque period (±1000–1200) and in early Europe. He wrote articles for the trade press, for Typography Papers, and several larger publications, such as Terwijl je leest, translated in Italian, English, German, Spanish and Korean.He lectures frequently, about type design and related subjects.